Hate speech law can be found throughout the world. But it is also the subject of numerous principled arguments, both for and against. These principles invoke a host of morally relevant features (e.g., liberty, health, autonomy, security, non-subordination, the absence of oppression, human dignity, the discovery of truth, the acquisition of knowledge, self-realization, human excellence, civic dignity, cultural diversity and choice, recognition of cultural identity, intercultural dialogue, participation in democratic self-government, being subject only to legitimate rule) and practical considerations (e.g., efficacy, the least restrictive alternative, chilling effects). The book develops and then critically examines these various principled arguments. 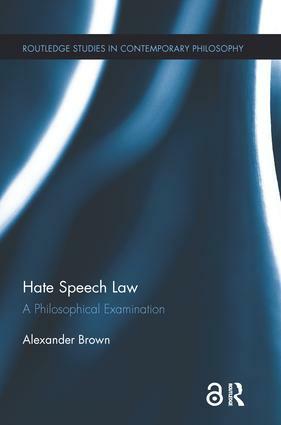 It also attempts to de-homogenize hate speech law into different clusters of laws/regulations/codes that constrain uses of hate speech, so as to facilitate a more nuanced examination of the principled arguments. Finally, it argues that it is morally fitting for judicial and legislative judgments about the overall warrant of hate speech law to reflect principled compromise. Principled compromise is characterized not merely by compromise over matters of principled concern but also by compromise which is itself governed by ideals of moral duty or civic virtue (e.g., reciprocity, equality, and mutual respect). The Open Access version of this book, available at https://doi.org/10.4324/9781315714899, has been made available under a Creative Commons Attribution-Non Commercial-No Derivatives 4.0 license.